So a bit of a disclaimer before I write this review. Fuzzies and Other People is the third book in the Fuzzy Series, preceded by Little Fuzzy and Fuzzy Sapiens. I have read neither of these books, and for all I know they add a great deal of richness and depth to Fuzzies and Other People, however, I would not know. I saw the cover of this book in a used bookstore, read the back, learned that the author had committed suicide before it had ever been published, and thought that was oddly tragic story for a cover that looked so cheesy, so I decided to buy it. I apologize for fans of the Fuzzies Series, since this review is less than a fair evaluation. Disclaimer aside, I didn’t hate Fuzzies and Other People, in fact I liked it a great deal more than I thought I would. It takes place on the fictional world of Zarathustra. A new race of sentient “people,” Fuzzy sapiens, have been discovered and their rights are being paid for and decided by the humans who discovered them. However, the intentions of some humans are not as pure as others, and some see the childlike naivety of the Fuzzies as an opportunity to take advantage of them. Zarathustra has complex ecological, political, and societal structures that Piper describes with skill and a great deal of knowledge. Fuzzy sapiens are small, golden-furred, bipedal creatures, capable of communication on ultrasonic frequencies. Their intellect is that of about a 5 or 6 year old child, but their archery, navigation, and tracking skills are highly advanced. Some of them are being “civilized” by the politically powerful humans on Zarathustra, they attend classes, practice tool-making skills, and learn to speak on a sonic level. Others are “wild,” they rove through the Zarathustra wilderness in packs, hunting land-prawns, and avoiding their primary predators, the flying “gotza.” Fuzzy care is provided by the humans who discovered them, paid for by “sunstones,” an abundant natural resource, similar to diamonds. The major conflict in the novel takes place when a small group of Fuzzies are manipulated by some ill-intentioned humans to steal sunstones. Much of the novel is spent determining the legal status of Fuzzies. The accused have the upper hand because lie-detector tests seemingly do not work on Fuzzies, their answers always present as truth. The man who discovered Fuzzies, Jack Holloway, insists that this is because the Fuzzies are incapable of telling a lie. The narrative alternates between this conflict, and a roving band of wild Fuzzies whose leader, “Wise One,” lies to his band so that they can go meet the, “Big People.” If you see where these narratives collide and resolve each other, then congratulations, you’ve come to first problem with the book. Fuzzies and Other People was painfully predictable, and I’m not the type to guess ahead. It’s just that Piper lays out the conflict, and the obvious conclusion, and follows through with it. There was nothing necessarily wrong with this, but it did take some of the fun out of what could have been a great book. I wish Piper had delved a little deeper into the idea of lying Fuzzies, and the idea that human influence could turn them wicked. Just like a child must eventually grow up, if Piper had introduced the idea that Fuzzies could turn bad it would have just created a richer story, a more enjoyable story. My second problem with Fuzzies was the people. Or, I suppose I should say, the “Big People.” They were characters, I guess, but I literally could not tell you a thing about them (and this is just two weeks after reading the book). What they looked like, what motivated them, I’m bored just thinking about them. One…..hunted? I think? That was his thing? Maybe? The humans were basically divided into, “good” and “bad,” and they were basically there to discuss Fuzzies, so that the reader could learn more about this new species. I would have enjoyed a detail or two, an anecdote or two, just something, ANYTHING, to make them a little more real. I don’t really understand why Piper couldn’t make the human characters more than talking heads, but perhaps this is why he never made a move to publish it before his demise. Thankfully, what is lost in the humans is a little more developed in the Fuzzies. Per Piper’s description, they are “permanent children,” this often drives the Big People they meet to protect and defend them. They are fantastic little creatures, adept at the aforementioned survival skills, yet somehow still lazy and gluttonous, the Fuzzies make for a compelling new race. In the Fuzzies, we also learn a little bit more about what they think, what drives them, the dynamics they share with each other. They are what gives Fuzzies and Other People most of its charm and readability. I liked this book enough to go back and give the whole series a chance, but not enough to ever read this particular book again. 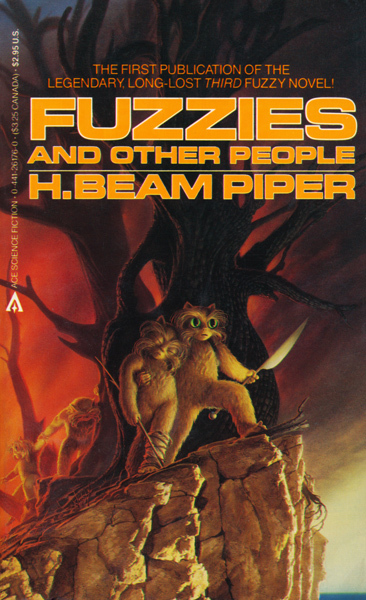 This entry was posted in 3 stars – a good book and tagged Fuzzies and Other People, H. Beam Piper, Julia. Bookmark the permalink.